Thank you for this, Matt. There are some pretty clear inflection points on that graph. It would be really interesting to try this for some other cohorts and see if the inflection points line up with the changes to the DSM. Here’s the table from the paper (there’s one table, on figure. It’s only 2 pages). There’s what appears to be a pretty significant jump in the numbers going from the change from ICD-8 to ICD-10. 1994. 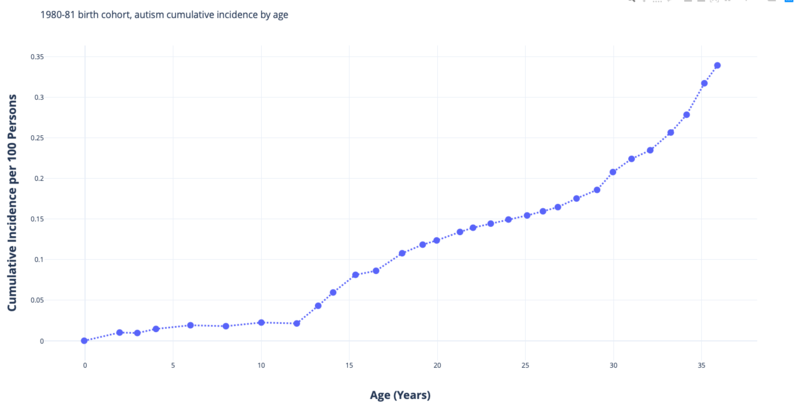 For the 1980-81 cohort, that’s the jump at age 14. And it looks like there’s a jump for the other cohorts as well in 1994. 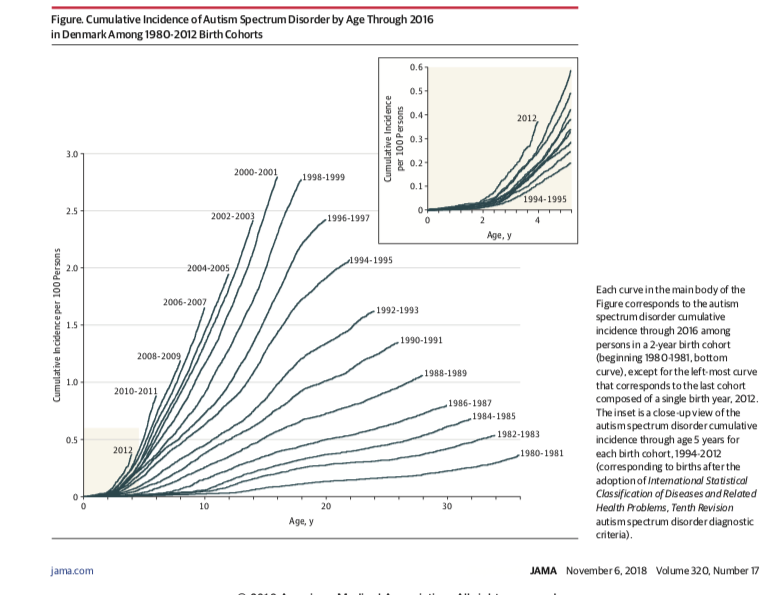 I don’t see how scientists can even measure this accurately when the definition and criterion for Autism is constantly changing as well as how symptoms/traits are interpreted differently by one professional versus another. Also, given that for many years people commonly believed it “went away” as a person reached adulthood, many adults’ symptoms/traits were misdiagnosed as other conditions, and still are. Then on top of that, many professionals that know how to recognize it in males still don’t understand how it can present differently in females, so therefore a whole bunch of females are routinely overlooked even today with more written about this in the literature. In addition, there are people who actually work in the field who don’t get the concept of why services for adults are needed. To those of us who found out later in life it is like living all our lives in a foreign country where we don’t speak the language. I tried unsuccessfully to explain this to a woman I met who runs a support group for people with Asperger’s. Apparently that didn’t mean she understood it one iota. Her day job was working with people who were so severely affected that they couldn’t function on any level, so in her eyes anyone who functioned better than that was just fine and didn’t need any help. She was oblivious to the fact that those of us who never received appropriate services are out here flying by the seat of our pants moment by moment and really have no place to turn when we have questions about how we are supposed to navigate this world. If we were to tell most people we encounter in the course of our lives everything we don’t know they either wouldn’t believe us (because of our masking) or would assume we were stupid (because they assume every adult on earth knows these things if one is reasonably intelligent). Adults on the spectrum are really caught between a rock and a hard place. The public/community needs to start listening to adults on the spectrum and what we need, but first they need to trust us that we in fact do have needs to be met and that we do struggle on a day-to-day basis. At this point in time acknowledging that there are many people falling through the cracks, and coming up with some empirical creative solutions to that systems problem is probably more crucial than developing statistics on incidence. Thank you, this is a very important article.